On November 30 of 2015, during his address to the climate delegates at the Paris climate talks, Prime Minister Trudeau uttered this inspiring catchphrase: “Canada is back my friends. Canada is back, and here to help.” We are ready to “take on a new leadership role internationally,” said Trudeau. These words are coming back to haunt him and his government. Canada is not back my friends. Canada is only half back! I can understand the new Prime Minister’s exuberance in Paris. Fresh off a convincing election victory, everything seemed possible. Canadians were thrilled to welcome in a new era of hope. And with him shining on the international celebrity stage, the emboldened and confident Trudeau was very convincing. After a decade of dreadful performances at international climate events by the Harper government, I and millions of other Canadians naively jumped on the Trudeau climate action bandwagon. We drank the Trudeau koolaid. Finally there would be action on the climate. And it was a great start. During the Paris talks, Minister of the Environment and Climate Change Catherine McKenna took the lead and worked tirelessly to push for the aspirational goal of 1.5°C of warming rather than the previously accepted norm of 2°C. Canada was indeed back in a leadership role. Sadly, the euphoria generated by Trudeau’s words in Paris dissipated very quickly once the Canadian delegation returned home. I’ve written previously about Canada’s two climate faces — the international one and the domestic one. Nothing says Canada is only half back more than the this photo showing federal and provincial officials announcing the approval of the largest natural gas project ever undertaken in Canada. Admittedly there has been some lightweight progress on tackling climate change since Paris. But each “accomplishment” is lacking in seriousness and comes nowhere close to addressing the widening gap between what is happening and what needs to happen. The following are examples of climate half-measures and sellouts. A First Ministers Meeting held in April resulted in the Vancouver Declaration. Much has been said about this event but it’s not much more than a plan to come up with a climate plan. The six-point document contains no renewable energy targets, sector specific regulations on GHG emissions, or any mention of Canada’s number one contributor to climate change: the oil and gas sector. The sole national target mentioned in the document is a commitment to meet or exceed Canada’s 2030 target of 30 per cent cuts in emissions levels compared to 2005 levels — a target established under the previous federal government that has been criticized as weak. (Source: Derek Leahy~DeSmog Canada). Canadians were asked for their ideas on how to address climate change during a summer of consultation meetings and an online conversation on the Let’s Talk Climate Action portal. The Federal government promised to use the results of the climate consultation process in shaping climate policy. More than 4,000 people submitted some 3,000 ideas and over 10,000 comments. I attended four climate consultations and submitted my carbon pricing guidelines and five climate pillars on the website. However an analysis by 350 Ottawa shows that the data collected has significant flaws. This government is not listening to Canadians. It’s becoming increasingly clear that the consultation process was entirely symbolic and just meant to buy time. The Liberals are proceeding with their own climate agenda that will include fossil fuel development and weak carbon reduction targets. In spite of a repeated call to freeze the expansion of the Tar Sands, end fossil fuel subsidies and reject new fossil fuel infrastructure projects, the Prime Minister continues to argue that building more pipelines to get more Tar Sands oil to tidewater is necessary to fund our transition to a clean energy platform and a green future. At a recent Canadian Climate Forum (which I attended), both Ministers Jim Carr and Catherine McKenna had the audacity and arrogance to tell an audience of clean energy advocates, environmentalists, economists, NGOs and climate scientists about their pro-fossil fuel climate strategy. People say, ’Leave the oil in the ground,’ they don’t want any development…Our view is we use the wealth of the old economy to finance the new energy economy. (Jim Carr, Minister of Natural Resources). I’m as much an economic minister as I am an environment minister…I’m going to lose some people along the way. (Catherine McKenna, Minister of the Environment and Climate Change). These revealing comments by Carr and McKenna come a month after the Liberals’ approval of the Pacific North West LNG project — a massive liquefied natural gas development which includes an export terminal and pipeline expansion. “Based on the LNG decision, equilibrium between Canada’s contribution to the mitigation of climate change and its energy ambitions remains as elusive as ever,” wrote Chantal Hebert in a Toronto Star article. How absurd! It seems we can reduce overall emissions by approving projects which produce more emissions — in other words reducing emissions by increasing emissions. Canada will be applauded at the COP22 talks starting in Marrakech on November 7 for its new national carbon pricing plan. The plan sets a floor price of $10 per tonne in 2015 rising by $10 per year to $50 in 2022. But let’s look at the facts. Even with the new carbon pricing policy, emissions will still be trending upwards by 2022. “It is certainly not enough to do our fair share to avert climate disaster,” says Cathy Orlando, National Director of Citizens’ Climate Lobby (CCL) in Canada. The strategy represents the lowest carbon common-denominator achievable considering Canada’s dysfunctional relationship between provinces and the federal government. BC’s support of national carbon pricing was only possible if Trudeau approved the LNG project. Alberta’s support is conditional upon the approval of pipelines to get its oil to foreign markets. Premier Wall of Saskatchewan is considering court action to block the plan. And Premier MacNeil of Nova Scotia promises to open a new coal mine. British Columbia Climate Plan: Includes a frozen carbon tax, more subsidies and weak emissions reduction targets that are lower than previous commitments. Premier Clarke prefers instead to balance the environment with the economy. The plan is simply a cop-out. Alberta Climate Plan: Alberta produces around 270 million tonnes of emissions annually. Under the climate plan, these will continue to increase until 2030. The Tar Sands emit 70 million tonnes per year and will continue to expand until it reaches 100 million tonnes per year. Another climate plan cop-out. So what awaits Canada at the Marrakech COP22 climate talks? How will it spin such puzzling half-measures into a positive message? Can Catherine McKenna convince the international climate community that the environment and the economy go together? Can she hide the fact that Canada’s climate policy is steeped in oil? Previous articleWhere Are Canadian Fossil Fuel Subsidies Coming From and Going To? Next articleThe Paris Agreement Is Now Official. Now What? Good Lord – Be grateful for what you have and stop whining about what you think is still missing. You have a Prime Minister and a Cabinet full of people who actually listen to the electorate and consult before making major decisions. You may not like all the decisions that are being made – but that is the reality of governance – not every constituency can be pleased. Look to what’s happening below the border. Do you want that type of governance? Make the governance that we have work to the benefit of all, not just to special interest groups. Frank – welcome to BoomerWarrior and thank you for your comments. If you call wanting the Prime Minister to respect Canadians by not saying one thing and then doing the opposite, whining, then I guess I’m a whiner. As for listening to the electorate by consulting with people, that is a complete myth – a smokescreen. The consultation is symbolic and this government is listening to the fossil fuel industry and provincial premiers who can’t see any further than their own navel. It’s not listening to Canadians. At the climate consultation meetings that took place all across Canada this past summer, the message was loud and clear. Canadians do not want further fossil fuel infrastructure projects – no pipelines, no expansion of the Tar Sands, no LNG projects. Since then, the LNG project was approved in BC and Trudeau is now poised to approve Kinder Morgan. So listening to Canadians, I think not. The worse possible candidate was selected here, Trump, but the electoral collage has yet to do the final vote & they can vote for anyone. Hillery got the most “popular” votes but I did NOT “vote” for Hillery as she is a lying WARMONGER & I have had my FILL of our illegal, unjust dam WARS! I too want to leave it in the ground, I don’t want carbon taxes as that hurts the poorest amongst us, I do want RATIONING of fuel that will cut carbon emissions & would discourage the use of large, filthy 4×4 trucks, vans, suv’s & motor homes. I still see no way that those high tech alternative energy devices can replace oil in manufacturing, keeping the grid up or replacing fossil fuels for transportation, the batteries we have now just aren’t up to it, their a low density storage system & there will be a serious problem with the RESOURCES needed to produce them unfortunately including OIL as fossil resources are still our only source of high density energy & raw materials which is what we must have to produce more of those alternative energy devices. Sorry Boomer but that seems to be the truth, it’s not what I want but that seems to be the trap we are in. I keep looking for a way to get around the laws of physics & nature but nature still bats last. For a while, we can & perhaps should make more of those alternative energy devices because at least where they are used, they can reduce pollution but they like oil are temporary. If Trump gets the vote from the electoral collage, then all our efforts to reduce greenhouse gases will be thwarted, oil, gas & coal will be increasingly burned & more drilling, fracking & mining of dirty coal will ensue, just what we don’t need. I feel a lot of emotional pain at what the water protectors in N.Dakota are suffering at the hands of our brutal police state & their vicious dogs. I told them that they would just bulldoze them out of the way & the pipeline carrying that dirty oil would be FINISHED. That is just what is happening, they are being bulldozed, beaten, gassed, arrested & taken out of the way of those destroyers. This government only respects POWER & we don’t have any. The amerikkan government doesn’t represent we the working class, they represent the military industrial complex, the uber rich & large, heartless, corporations, they are an EMPIRE & this empire must have OIL & it will get oil over the dead bodies of those trying to stop them. Sheila – Donald Trump has won the election period. He didn’t get the popular vote but he did win a majority of the electoral votes. He won. And you’re right. If Trump follows thru on all his anti-climate rhetoric, we are totally f#*ked. Not quite yet Boomer, the electoral collage still has to VOTE, what Trump got was enough state electors to win but the members of the electoral collage can still choose either of those two candidates & if I were an elector, I would carefully consider my choice. Choose a man hated & feared world wide, a man who is a racist, homophobe, misogynist etc to be our ruler or a woman who got the most “popular” votes who people here also hate for her warmongering, lying & cheating? I would hate to be the elector that has to choose between those two! I would have at least liked to have seen us try to prove me wrong about “renewables”, how much of the load could they have carried, for how long & will their manufacture save more pollution than was produced in their manufacture? In any case, no matter who’s right about “renewables”, we are still totally fu#ked thanks to overpopulation & decline of essential resources & more. I did not know that about the power of the electoral college. But I think it’s a done deal. As far as the power of renewables and emerging battery storage technology, I have no doubt that the future lies in a clean energy platform what will include wind, solar, geothermal, tidal, nuclear, hydrogen, fusion. There are solutions out there that we haven’t even thought about yet. We don’t know what we don’t know. It sounds a lot like Canada is taking a leaf out of China’s clean energy policy. Keep the fossil fuel profits to pay for clean energy. Our governments are not going to do it! 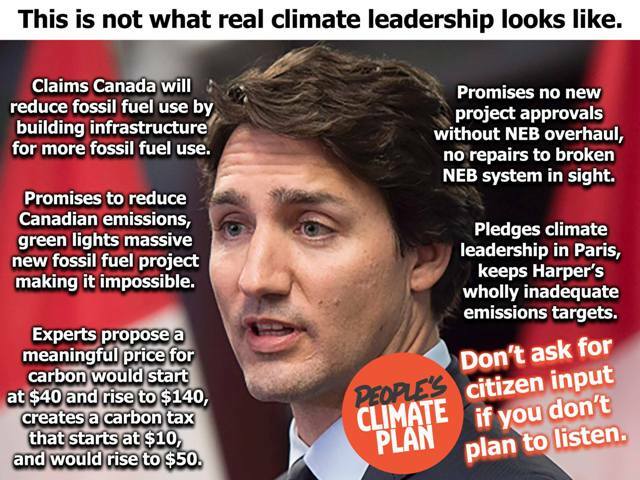 Canadian action on the climate is hypocritical and disingenuous. I find it deplorable. In Marrakech, Canada is getting the drubbing by the global community on the gap between rhetoric and genuine action. I’m doing a piece on that right now. Good YouTube link – thanks.